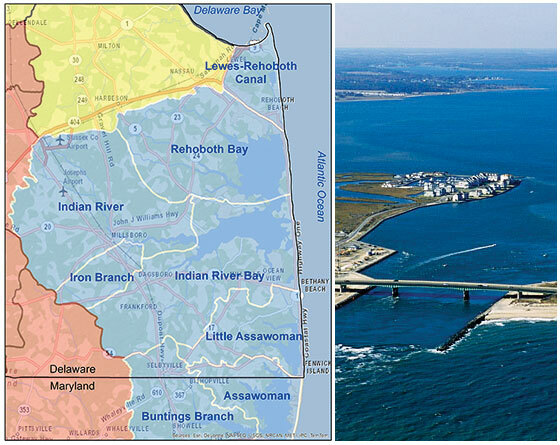 The Inland Bays/Atlantic Ocean Basin comprises approximately 313 square miles of eastern Sussex County, Delaware. Starting at Lewes and Cape Henlopen State Park at the southern edge of the entrance to Delaware Bay, the area extends southward approximately 24 miles along the Atlantic shoreline to the Maryland State Line. It includes the coastal towns of Rehoboth Beach, Dewey Beach, Bethany Beach, South Bethany Beach, and Fenwick Island. State Route 1 (SR 1) extends parallel to the shoreline and connects the towns. At the Maryland State Line, the Basin boundary extends westward approximately 16 miles to the western edge of the Cypress Swamp and thence along an arcuate line extending northwestward about 19 miles to Georgetown, the county seat of Sussex County. Along this boundary, starting at the Maryland State Line and proceeding northward, the towns of Selbyville, Frankford, Dagsboro, Millsboro, and Georgetown are connected by U.S. 113. The northern border of the Inland Bays/Atlantic Ocean Basin roughly parallels SR 9 and extends from Georgetown northeastward back to Lewes and Cape Henlopen State Park. The dominant physiographic feature of the Basin is the three "inland bays" that are located just landward of the Atlantic Ocean shoreline. From north to south, these are Rehoboth Bay, Indian River Bay, and Little Assawoman Bay. Rehoboth Bay contains the Lewes-Rehoboth Canal and Rehoboth Bay Watershed; the Indian River Bat contains the Indian River, Iron Branch, and Indian River Bay Watersheds; and the Little Assawoman Bay contains the Little Assawoman, Assawoman, and Buntings Branch Watersheds. Other distinctive physiographic characteristics include the flat topography and man-made drainage ditches that are used to drain soils with perennially high water tables, which are mostly limited to the area south of Millsboro and Indian River Bay. The Inland Bay waters are highly enriched with the nutrients nitrogen and phosphorus, the contaminants having the greatest impact on the surface and groundwater of the Inland Bays. While nitrogen and phosphorus are essential for plant and animal growth, when excess amounts enter the bays, water quality can deteriorate as aquatic plant growth accelerates and the level of oxygen is reduced, leading to eutrophication. Existing contamination may be the result of either pastor present human activities. Past practices, such as landfill operations (now closed) and Superfund sites, may still be contaminant sources. Contamination from current activities may occur routinely, as in a permitted discharge of a municipal wastewater treatment plant; or may occur as a result of a spill or leak, as in ground-water contamination from a leaking underground storage tank. Contamination may be transported or exchanged between various media, such as a contaminant that was land applied that is subsequently transported in ground or surface water. Nitrogen and phosphorus originating from agricultural activities have been identified as key factors in non-point source pollution in the Inland Bays/Atlantic Ocean Basin. There are approximately 72,000 acres of agricultural land in the Basin, representing more than 40 percent of the total land area. The majority of croplands are devoted to growing corn, soybeans, and sorghum, which go to feed the Basin's thriving poultry industry. Agricultural lands are highly susceptible to nutrient loss. Factors such as soil type, depth-to-ground water, topography, ditches and drainage ways, and precipitation all affect nutrient transport in the Basin. Water-quality samples collected from several agricultural drainage waters within the Basin show elevated levels of both nitrogen and phosphorus in the waters, at levels that exceed water-quality standards for streams in the Basin. Average nitrate concentrations in the waters from two sites averaged 5.8 and 4.6 mg/l. Ammonia nitrogen was also found in the waters ranging from 1.0 to 9.1 mg/l at one site and 0.18 to 6.8 mg/l at another. These values exceed the 0.14 mg/l water quality standard for nitrogen in the Basin. Total phosphorus levels in the waters were also consistently higher than the 0.01 mg/l phosphorus water-quality standard for the Inland Bays. Values of total phosphorus ranged from below detection levels to 0.34 mg/l at one site and 1.7 mg/l at another. The game species most sought after within the Inland Bays are summer flounder, sea trout, bluefish, tautog, white perch, rockfish, and winter flounder. In addition to these species, smooth dogfish, sandbar sharks, and kingfish are caught in the surf. The fishery in the ocean has the added variety of pelagic fish such as white marlin, yellowfin tuna, mako shark, cod, and ling. The Inland Bays/Atlantic Ocean Basin lies entirely within the Atlantic Coastal Plain Physiographic Province. The Coastal Plain consists of a series of southeastward thickening, unconsolidated sediments of Cretaceous through Holocene age deposited atop the Paleozoic and Precambrian crystalline "basement" rocks of the Appalachian Piedmont. The sedimentary Coastal Plain deposits are an alternating sequence of sands, silts, and clays laid down in a variety of geological environments. The utility of the deeper aquifers in this sedimentary sequence is limited by increasing salinity and iron content with increasing depth. The shallower aquifers are vulnerable to contamination resulting from conflicting land uses, including shallow septic tanks, agricultural runoff, man-made alterations of natural drainage patterns, and commercial and residential land development. To date, there is little industrial development in the Inland Bays/Atlantic Ocean Basin. The land surface of the Basin rises from sea level in the east to an average elevation of 25 - 30 feet in the west. A barrier island separates the open ocean from the Inland Bays. The barrier beach is the transition zone between land and sea and provides protection to the shore from damage by coastal storms and hurricanes. The dunes are storage areas of sand that have been blown inland during dry periods. Unless disturbed by human activities, they are stabilized by vegetation that can withstand salt spray and even burial by sand. When they are stabilized by vegetation and are protected by a wide beach, dunes provide a very effective natural protection of the bays and inland areas against flooding during storms. Soils begin at the land surface and extend downward to various depths, usually measured in inches or feet. Soils in the Inland Bays/Atlantic Ocean Basin may grade almost imperceptibly into the unconsolidated sedimentary geologic units below. "Soil" may be defined from a geologic, engineering, agricultural, or other point of view, depending on one's purpose. The soil survey of Sussex County shows six soil associations in the Inland Bays/Atlantic Ocean Basin (Ireland and Matthews, 1974). The most extensive soils are sandy loams that are well drained north of Indian River Bay and poorly drained to the south of the bay. Approximately 1,500 miles of drainage ditches drain the soils throughout the Basin. As residential development continues in the eastern portion of the Basin, the focus is shifting from soil drainage for agricultural purposes to storm-water management in residential areas. The Inland Bays/Atlantic Ocean Basin is particularly favorable for agricultural production because the soils respond well to management, the temperate climate provides a fairly long growing season, and rainfall is well distributed. General soil management practices are applicable to all or nearly all of the soils used for crop production in the Basin. These practices include draining the soils that are too wet part of the year or most of the year, applying the proper soil amendments (manure, commercial fertilizer, lime), choosing suitable crop rotations, managing crop residue (cover crops), and irrigation. More than eleven miles of Delaware's ocean coast are developed with homes and businesses. The majority of them are located on the barrier island - the think strip of land separating the ocean from the Inland Bays. Sea-level rise, storms, and other natural coastal transport processes are causing the barrier island system to migrate in a landward direction. As development continues around the Inland Bays, requests for new dredging projects increase along with population. Dredging removes bottom sediments to create or maintain safe, navigable channels for recreational or commercial boating purposes. In Delaware, dredging is also used to obtain sand for beach restoration activities, to remove unwanted sediments and vegetation from state-owned ponds and lakes, and to control sediment deposits in inland waters. The Inland Bays Watershed contains rapidly growing industries of poultry farming and second-home residential development. Since the 1960s, a huge influx of people from neighboring states has continues to swell the basin's seasonal and permanent populations. The poultry industry has simultaneously experienced enormous growth, contributing to dramatic changes in land use and degradation of the basin's land and water resources. 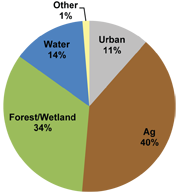 Urban land use covers about 17% of the basin. From 1992 to 1997, residential and general commercial urban land use expanded by 3%. If this rate of urban growth continues to 2020, about 29% of the basin, excluding open water, will be in urban land uses. During the same five0year period, agricultural land decreased by about 2,327 acres and forest cover by about 3,200 acres. Most of the new urban growth has been along Route 1 near Rehoboth Beach and Lewes and in the Long Neck area. The Inland Bays/Atlantic Ocean Basin includes four of Delaware's fourteen state parks: Delaware Seashore, Fenwick Island, Holts Landing, and Cape Henlopen. These parks comprise about 8,600 acres - approximately 43 percent of the acreage in Delaware's state park system, taking in more than 14 miles of Delaware's 24 miles of Atlantic coast beaches. The Division of Fish and Wildlife manages more than 3,200 acres of land and water in the Basin that draw visitors for fishing, hunting, and other forms of recreation. These include Assawoman Wildlife Area and fishing sites such as Love Creek, Ingram Pond, Massey's Landing, Pepper Creek, Millsboro Pond, and Rosedale Beach. Hiking and bicycling are activities that continue to grow in popularity. Trails and pathways are a growing part of Delaware's recreation infrastructure. Over the past 10 years, the public has recognized a need to develop and expand trails and pathways to use for fitness, recreation, nature exploration, and transportation. Camping is a popular activity in the Inland Bays/ Atlantic Ocean Basin. More than 20 private campgrounds and 2 public campgrounds at Delaware Seashore and Cape Henlopen State Parks provide more than 5,000 campsites. While data are not available on the use of private campgrounds, the Division of Parks and Recreation maintains data on attendance at its campgrounds. During 1997, the public campgrounds at Delaware Seashore and Cape Henlopen State Parks received more than 120,000 visitors. Cape Henlopen has 159 campsites, all with water hookups, that are open April 1 through October 31. Delaware Seashore has 145 campsites with water, electric, and sewer hook-ups, and 133 campsites with no on-site utility hookups, with an additional 156 overflow campsites. Campsites are available from March 10 through November 11, and open year-round for self-contained units. The forests of Delaware's Inland Bays contain a mixture of pine and hardwood species. Forests found in the Inland Bays/Atlantic Ocean Basin contain several tree species, including loblolly pine (Pinus taeda), Virginia pine (Pinus virginiana), white oak (Quercus alba),southern red oak (Quercus falcata), scarlet oak (Quercus coccinea), willow oak (Quercus phellos), tulip tree (Liriodendron tulipifera), red maple (Acer rubrum), sweet gum (Liquidamber styraciflua), black gum (Nyssa sylvatica), sassafras (Sassifras albidum), dogwood (Cornus florida), and others. The floor of a healthy mature forest is usually vegetated with an understory composed of a variety of woody and herbaceous plants. Within the Basin, there are an estimated 55,000 to 60,000 acres of forested lands. Most forestland is owned by private landowners, including approximately 3,500 acres owned by the forest industry. These landowners manage their forests for a variety of objectives, including timber production, wildlife habitat, and recreational activities.